Renn Brown: We need more superhero movies like this. It only takes a mere few lines of narration, a quick introductory car chase, and a couple moments of character set-up for Dredd to take off on its hyper-spare story of one Judge and the rookie he’s saddled with for the day. The film takes for granted that we need to see as much of Cursed Earth as we do Dredd’s face to know what’s up, and it’s a choice that sets the tone for a film full of simple, effective approaches to action storytelling. Resembling (to an almost uncomfortable degree) last year’s The Raid, Dredd features a plot so straightforward it would make Carpenter blush. Stumbling onto one of Mega City One’s largest drug dens housed in a 200-story tower, Dredd (Karl Urban) and the Under-Assessment Judge Anderson (Olivia Thirlby) find they’ll have to battle an entire complex worth of minions of the feared narcotics queen Ma-Ma (Lena Headey). I’m not sure how and when Alex Garland’s writing timeline intersects with him seeing Gareth Evan’s aforementioned martial arts flick but –even if it is a wholesale ripoff– I wish Hollywood always managed to steal the right elements as effectively. Dredd 3D is a breathless, brutal, and often beautiful spectacle that ends up being one of the most satisfying action films of 2012. Nick Nunziata: I think the satisfaction of the audience has a lot to do with their cinematic experience. This is a movie steeped in 80’s aesthetic and audiences may cling to it or feel like they’ve seen it before. The Raid is a Tower Defense story set from the perspective of someone trying to conquer the tower. It’s as formula as formula gets and nothing new. The emphasis on Dredd‘s resemblance to The Raid is irrelevant. The Raid is about seeing amazing choreography and inventive use of the human form as a combat weapon. 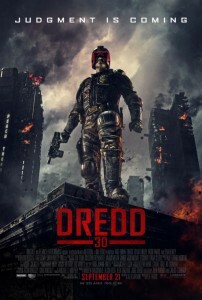 Dredd is a late 80’s/early 90’s genre film packaged for today’s audience. It’s the Paul Verhoeven movie Paul Verhoeven never made and dollars to donuts it’ll be a more authentic Robocop film than the upcoming remake. The movie is pretty solid thanks most in part to its leanness and plentiful of slow-motion bodily harm. Though he starts off a little monochromatic, Karl Urban does a very solid job of investing the titular character with enough density to not come off as a cardboard cutout and though I have no major gripe with the film Sylvester Stallone made all those years ago this is a lot more in the wheelhouse of the comics. Renn Brown: I think it’s pretty natural to compare two films with identical premises being release within a year of each other, but it’s surely true that the goals and execution are wildly different. I’d also give even more credit to Urban, who has all the arc that single issue of a comic book might ever lend him and yet we get a sense of a man behind that never-absent helmet. It’s not a trifling accomplishment to capture an in-mouth-only badass with a combination of great physical work, deftly gruff vocal choices, and delivery that is a perfect balance of sardonic bluntness. It’s a performance that I’d love to see a whole lot more of (so I’m hoping lots of go see this). It doesn’t hurt that this ruthless tank of a man is balanced out by a woman whose psychic abilities almost make her a being of pure empathy. The script makes the right move and gives her character some teeth pretty early on, but she still balances out Dredd effectively as a gentler Judge. The structure of the film is also pretty sharp about balancing their teamed-up and solo time, without ever rendering her completely useless. Frankly, it’s to Thirlby’s credit that she isn’t entirely a sore thumb amongst all these violent, grungy doings, even if she’s always operating in the familiar “unlikely badass” mode. Heady’s Ma Ma has a strong role to play in that balancing act as well, keeping this from being a sausage fest with nothing but guns and testosterone to power it. Nick Nunziata: This is certainly everything Doom wasn’t for Karl Urban and yes, Thirlby isn’t nearly at distracting and annoying as that character could have been. Typically the inclusion of a fresh-faced rookie in a muscular action flick slows things down and is simply a device but here the telepath angle earns some mileage. Especially since her main adversary is The Wire‘s Wood Harris and they have a few choice moments together. There are some odd directorial choices here, and Pete Travis has yet to deliver a wholly successful feature (Vantage Point is a hot mess) so it’s not a major surprise that amidst the wanton gore and slow-motion drug induced slaughter there are some hiccups. The best elements occur when Dredd is dispatching justice with his myriad of techniques and ammo variations. Judge Dredd is Dirty Harry, Robocop, and the Punisher all wrapped up in one package and though there’s not quite the fascist underpinning some of the comics had the premise is lucid and hard to mess up provided the filmmakers stay on target and don’t try to do too much. Dredd doesn’t try to do too much. It’s simple and it’s simply fun. Renn Brown: It’s sad commentary on the state of blockbuster screenwriting that such a fun, simple film is so refreshing, but I can’t help but get enthusiastic about a contemporary movie that offers an explosive good time without any intellectual headaches. Beyond leaping that low bar, Dredd also manages to carve out some real estate among unique action films, as the narcotics angle is truly inspired. Storywise it’s easy to believe in a drug like “Slow-mo” becoming a major hit on the black market, and in terms of filmmaking it gives Travis license to find some beauty among all this grungy squalor, or really hone in on the ugliness of the film’s violence. It’s something you can pull off when you hire a cinematographer like Anthony Dod Mantle (Antichrist, 127 Hours), and a smart way to approach an old trick. Considering Travis isn’t a filmmaker whose work I’m eagerly anticipating at any given time, I’d be happy to hear of him continuing with this franchise. It’s a playground that seems to work for the director, and there’s plenty of concise little action stories that could be told in Mega City 1 with Urban tossing on that helmet every once in a while. As long as each entry could find a feather or two to jam inside its helmet like this reboot’s simple premise and interesting visual motif, cinemas could use some judgement every few years. For now though, Dredd operates with ample balls and sufficient brains to be among the better action films of the year. Nick Nunziata: It’s fun and it has its moments. And it has a face getting shot apart in slow-motion, which is important. This is the perfect time of year for Dredd. It’s a movie that shares a kinship with fun straightforward actioners like Rambo IV and Punisher War Zone. It’ll soon fade from memory but it’s a great carefree way to kill a couple of hours.And frankly, we need Karl Urban out there.